Great leaders are able to connect with their team. Leaders must bring humility and sometimes follow, while others on the team must first earn credibility and trust before they pursue their own leadership desires, say Toomer and Caldwell. In their book, they focus on 12 competencies that leaders use to elevate their teams, with illustrations including the “no-stats all-star” basketball player Shane Battier and Sandeep Das, who plays the tabla, a percussion instrument, with cellist Yo-Yo Ma. Knowledge@Wharton: What exactly is the “catalyst effect,” and what inspired you to write about it? Jerry Toomer: The catalyst effect takes an approach to leadership that is not dependent on title or authority. Our premise is that you can lead from wherever you are. One is obviously the business community, and we talked with people who have experience leading without authority. We also researched the sports environment. We have an introduction by Brad Stevens (head coach of the Boston Celtics basketball team) and we rely on Shane Battier’s reputation as a no-stats all-star (i.e., he may score zero points in a game and still be the most important player in the team). We also covered the arts – for instance, tabla player Sandeep Das, who plays with cellist Yo-Yo Ma and The Silk Road Ensemble, a musicians’ collaborative. With that as our spark, we wanted to complete our field research and then write a bit about the subject, because as organizations restructure and millennials come into the workplace, we feel there’s a real place for this approach to leadership and leadership theory. Craig Caldwell: We used what’s called a grounded research approach, where you [examine] something with no a priori idea about it. You just have to keep digging and investigating, and asking questions and making notes, and then distilling that down and synthesizing it so you finally end up with a product that makes sense. Knowledge@Wharton: Could you offer a couple of examples of leaders who embody that style of leadership? What sets apart that approach from other styles? Toomer: A bit of our spark for the book is Shane Battier in the NBA (National Basketball Association). Shane was player of the year coming out of Duke [University], drafted by the Memphis Grizzlies, and was having an okay NBA career, but then he moved to the Houston Rockets. When Shane moved to the Rockets, they were heavy into analytics, and Shane became known as the no-stats all-star. That is, he was seldom in the box score as the person who scored the most points or got the most rebounds. But when he was on the court, the team played better. They statistically had clear evidence that that was the case. So, Shane was a bit of the spark…. When he’s on the court, he elevates the play of everyone around him, without necessarily being the captain or the star player on the team. Knowledge@Wharton: How did he do that? What does he do differently that sets him apart? Toomer: I asked him, “What is it that you do differently?” He chuckled and said, “What I try to do is I play so hard that the coach can’t afford to take me off the court.” For him, it’s a bit unconscious and natural. But when you hear him actually get serious about analyzing what he does, he does some very specific things on the court. Caldwell: One of the skills that we identified is connecting emotionally with those around you. I think Shane would probably be the first to say he wasn’t sort of the buddy-buddy backslapping friend to everyone on his team. He was very much about this as a business, and a profession – a “We’ve got a job to do” sort of approach. He was very disciplined in that way. Yet he was able to connect with people, and in some cases, people that may have felt as if they didn’t need his help. Those pieces of information, even when unsolicited, have a profound impact on helping somebody defend somebody else better. In interviews with the Indianapolis Symphony Orchestra, and asking folks there about whether this phenomenon resonates with them, and if they could think of [such] an individual, one person they described as being a catalytic player was a diminutive woman who plays the bass. It’s the largest instrument, with a small woman standing behind it, in the back row of an orchestra. How is it possible that this person could be catalytic? What was interesting about it was that all of the people around her in that section fed off her energy and her enthusiasm. The spiritedness with which she played was infectious. Again, she’s not talking to them. They’re in the middle of a piece, and they’re observing her approach and her movement and things like that. Based on that, we then identified the four cornerstones and the 12 competencies that comprise the backbone of the book. Knowledge@Wharton: In the beginning of the book, you use the metaphor of the jungle gym to describe catalytic leadership. Could you explain how that fits into your framework? Toomer: You can think about the jungle gym in two different ways. The first way is in the career sense — your career is a jungle gym. It’s not just a straight ladder, but you move laterally to different functions or different geographies and back up. The other use of the jungle gym is developing the skills. As you develop the 12 competencies, it is like a jungle gym. Do some of these skills come naturally in the order at the beginning? Yes, those such as building credibility, communicating well, et cetera. But once you get past that basic price or cost of entry and credibility, you can move through the competencies and enhance the ones that you think are your strengths, and then develop the ones where you think you may have some gaps. The jungle gym is putting all those together in your own unique way as a catalyst to be the best influencer and elevator of performance on teams that you serve on. Caldwell: One piece about that metaphor that resonated with me was its ability to handle more of a team orientation than, say the ladder metaphor. In observational studies they’ve done of jungle gyms, children playing on them are very likely to lend a helping hand to help somebody get to the top rung. Knowledge@Wharton: Your book describes 12 competencies that leaders use to elevate the performance of their teams. You begin with competencies that help leaders to build credibility. Could you speak about those, and offer some examples of how leaders have used those competencies to build credibility? Caldwell: Those four cornerstones in some ways come in a certain order. Let’s imagine a scenario where you’re new to a team. Before you can have a chance at really influencing people, or amplifying your own impact by scaling yourself, you have to do some baseline stuff around establishing credibility. That is the first cornerstone. It’s around trust and integrity, following through on things that you say you’re going to do, and being very clear about your communication. You’re executing on behaviors around developing integrity, communicating clearly, and coming in with some degree of spirit every day. Saying, “This is an enjoyable situation,” and “We should be excited about this,” and infecting other people is a great way to launch your experience with that team by establishing credibility. Toomer: Those are a price of entry. In the book, we give some examples, particularly in sports arena, where those are critical. They’re just as critical in the business arena…. It gets into what the meaning of trust is – “Do I trust you to be competent? Do I trust you to do what you say you’re going to do? Do I trust you to not talk behind my back?” Those core things are necessary for cohesive teamwork. Knowledge@Wharton: The other area that you highlight in the book is how leaders create more cohesion within their teams. How do you see the role of emotional intelligence and camaraderie in building effective teams? Caldwell: Once we had our list of 12 skills and behaviors, we went back to the interviewees and asked them additional questions to gain more clarity about them, to make sure that they felt comfortable with the 12 skill sets we developed. One question we asked was, “Which of these skill sets is the most difficult?” A shocking majority focused in on connecting emotionally as one of the most difficult things to do. It starts with the self and awareness of the self. What are my emotional needs; what am I like? I need to be aware of that. In some situations, people are shockingly unaware of it. A second part is, now that I know something about myself, am I disciplined enough to manage that? We can extend that to other people: Now I can have an opportunity to know you, your needs, your emotional activity, and then [help] you achieve what you want. Shane was a bit of the spark…. When he’s on the court, he elevates the play of everyone around him, without necessarily being the captain or the star player on the team. One of the things that popped through in the data for me – and I think this is a manifestation of people doing a good job of connecting emotionally – was that it seemed to us as though a lot of these organizations were low-drama settings. There wasn’t a lot of emotional up and down constantly every day, and seesawing back and forth on things. These were folks that were really in there, focused on the work, and taking care of the work. In order to do that well, they were taking care of each other quite well in an emotional sense. They understood the baggage that somebody might be coming to practice with that day or coming to the office with that day … honoring it. Not in a sympathetic sort of patronizing way, but with genuine empathy for this person. Knowledge@Wharton: An important part of building cohesion, and even connecting with people emotionally, is how leaders manage conflict within their teams. 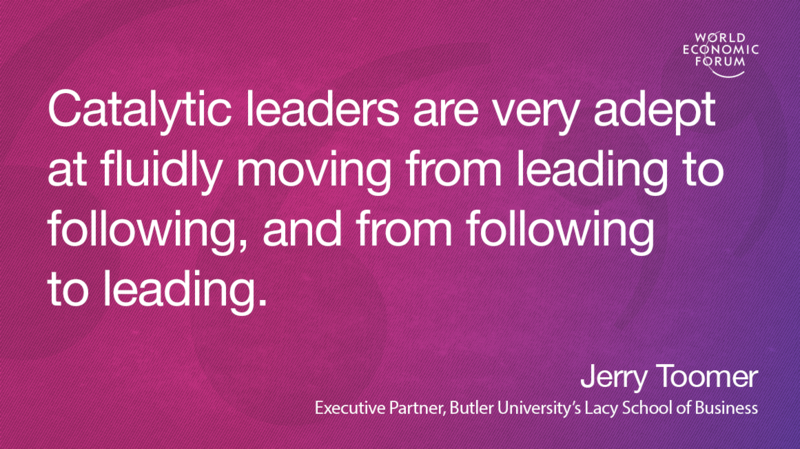 How do the most effective catalytic leaders do that well? Caldwell: When we use the word leader, it’s important to focus on exactly whom we’re talking about. For us, this is someone who’s on the team, is not a superstar and doesn’t have a CEO title. The beauty of that is if you have a catalyst on the team doing this kind of activity, it allows the functional leader, the person at the top of the organizational chart, to focus on other aspects of the business. It’s not the job of the catalyst to necessarily manage the emotions and relationships of other people, but they are doing that. Even though it’s not their responsibility, this person is the very first person to reach out to [others] and find out what their journey to this point has been. Knowledge@Wharton: On the next construct, what interested me a lot is how some leaders help their teams by putting the team’s goals above personal interests. Toomer: That’s core to our idea about being a catalyst – it’s not about me; it’s first and foremost about the team. If a choice has to be made about who gets the credit, it goes to the team. When team-focused individuals put the team’s goals above their own, those teams perform more effectively and much better. We saw that in our interviews in all three of the sectors – arts, sports and business. Catalytic leaders are very adept at fluidly moving from leading to following, and from following to leading. Caldwell: In an interview we conducted with Brad Stevens, the current head coach of the Boston Celtics, he talked about team achievement. He talked about teams with talent going quite far. He believed that the only way those teams would achieve at the highest levels, and maximize their potential for achievement, is if everyone was coming in and playing a role towards the goal that the team had set. Knowledge@Wharton: You also in your book list a cornerstone that is about generating momentum. You identify competencies that allow leaders to energize others and upgrade skills. What I found fascinating is how some leaders lead and follow at the same time. Toomer: Even when you’re the CEO, with title and authority, you don’t lead all the time. You still in most cases have a board of directors. You have peers or you have executive team meetings where it’s either necessary or appropriate that you follow. You may not have all the knowledge. Someone else is smarter or has more depth in a particular area. Someone else leads a particular discussion on a certain topic. This is related and maybe tangential to the discussion about strong-minded people who want to be the CEO. Are they willing to follow and are they willing to step back? Our premise is that catalytic leaders are very adept at fluidly moving from leading to following, and from following to leading. [One example is] improv. What you do in improvisation is you lead and follow. Somebody throws out a line and you follow. You pick up on that line and you go and you run with that idea for a while, and then you leave it and somebody else picks it up and follows you. You’re constantly in this fluid lead-and-follow situation. In that setting, this lead-and-follow piece becomes important. You are leading up when you go to your boss and say to them, “Boy, I’m not sure about the path that we’ve selected here; I’ve got some concerns.” It would start a conversation with your boss about those concerns. Maybe [your boss] shares a piece of information that you didn’t know prior, and that changes [your understanding]. You have a responsibility here as a follower to lead. Knowledge@Wharton: It seems that a major obstacle to developing catalytic leadership is arrogance. What could leaders do to avoid falling into that trap of letting arrogance prevent them from becoming more effective? Toomer: Self-realization. You’re not always the smartest person in the room. Until we all recognize and understand that, arrogance can be a real trap. So, to put yourself in positions during your development where you’re humble – whether it’s a new job or a new geography or new situation – is very useful. Caldwell: It’s about whom you surround yourself with, and how good they are. If they’re good at their jobs, I expect them to hold me accountable for things. Knowledge@Wharton: The last set of competencies you identify as the fourth cornerstone are about amplifying impact. These are competencies around pursuing excellence, mentoring and coaching others to excel, and exercising your imagination. Why are these important to catalytic leadership? Toomer: The first nine competencies are in many ways essential, and are important to good teamwork. But unless you have an impact, and unless you have a result, you haven’t succeeded. If they are aligned and done well, these competencies will lead to the opportunity for the team to amplify its impact and perform better. Caldwell: This is about mentoring and coaching others to excel. This cornerstone is around the concept of scaling yourself. If you’ve gotten good at the first nine competencies, it’s important that you be able to scale those nine, in order to amplify that impact, and have others who are starting to behave like you have to this point. Knowledge@Wharton: You both spoke about arrogance being an obstacle. What are some of the other barriers that prevent leaders from becoming effective catalytic leaders, and how do you think they can work on those barriers? Toomer: Valuing continuous learning and personal development at whatever level or stage you are in your career is essential. Caldwell: Sometimes success can breed complacency, laziness and things like that. If you’re experiencing great success in your career, and you start to believe a little bit too much that you are the one solely responsible for making that happen, and you start relying too much on your perceived expertise and superiority, that’s going to be problematic in terms of being a good catalyst. Knowledge@Wharton: What advice could you offer leaders who want to be catalytic, and who want to elevate the performance of their teams? Are there any practices that you could recommend that will show immediate results? Caldwell: It’s important to encourage these folks to start to develop a healthy appetite for self-assessment, whether that’s performed with 360-degree feedback instruments or strength finders or having a mentor. Toomer: After self-assessment and self-evaluation, you need the willingness to reflect on that, usually with somebody else, and then figure out what you could do to get better.